E-Z-GO didn't back down from our Ice Bucket Challenge. In fact, they were happy to get an excuse to cool off from the Augusta, Ga., heat. Several members of the leadership team at the iconic golf-cart manufacturer took the challenge on Friday which aims to raise money for research and awareness about ALS, also known as Lou Gehrig's Disease. They took it in one of the more unique ways possible: car-wash style while riding, naturally, on a golf cart. 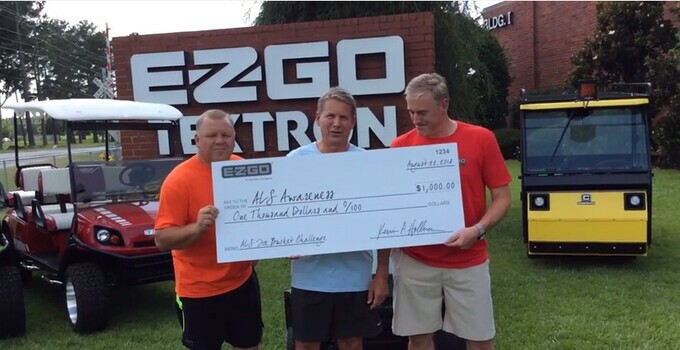 And, on top of taking the challenge, E-Z-GO is donating $1,000 toward ALS research. Way to go, guys! Let's keep it going.